If you have even be even remotely interested in Human Trafficking or working for the UN this is a must read. After watching the movie, well that was calm, compared to the real life book. Its been amazing how much the government spends on contract work, since we (America) don’t have a national police force we are in turn spends billions on people super under qualified. It was also sad to see people blame everything on war but it was 4 years after the real war. Which is a huge problem with ethics that its not in war but post war- different. 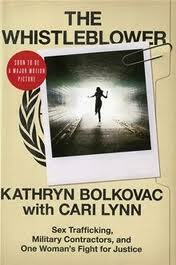 For me this was interesting since it was in the Balkans which I spent 2 years living in. When we went there were still holes in the wars of buildings and then some of them were filled in with red, they are called “rose” to remember. I also feel a since of pride since Kathryn was a Nebraska police officer before, so my Nebraska pride was super high while reading this. Read, read, read! It will make you think about what is happening around the world right now, with “America” time, money, and people.